Plantain, buttercup and lesser stitchwort. 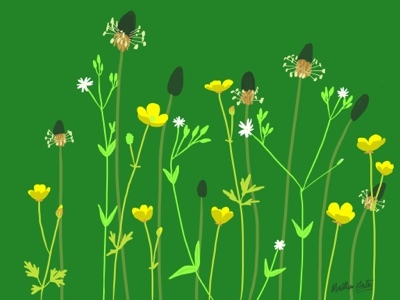 Walked along one of my favourite hedgerows this morning and drew these flowers. Not a lot of colour around yet but the hedgerows seem quite lush and with grasses, cow parsley etc. This particular hedge runs beside a bridleway and doesn't get mown so lots of interesting plants entwine themselves together here. These flowers grew on the edge of the muddy track. I liked the delicate anthers of the plantain, the tiny white stitchwort flowers and the bright yellow buttercups against a dense green background of leaves and grasses of the wild herbaceous border behind.